Unannounced, President Obama took to the lectern in the White House briefing room today to give a personal readout of his meeting earlier with congressional leaders of both parties. "Despite the political posturing that often paralyzes this town, there are many issues upon which we can and should agree, he said. It was more a plaintive plea than a political observation. His top legislative priorities are going nowhere and he's searching for a way to get them out of lockup. In this 13th month of his presidency, he's anxious to pass a jobs bill and be seen addressing an unemployment rate that only last week declined from double digits. And his efforts to enact bills on energy, financial regulatory reform and especially health care are stuck in Congress despite the solid majority his party holds in both chambers. He's appealing for a spirit of bipartisanship - urging Democrats and Republicans alike "to put aside matters of party for the good of the country." It's a familiar refrain from U.S. presidents who can't get their way in Congress. "We must put aside our political differences if we're ever to set our economy to rights," said President Reagan in 1982. "We must put aside partisanship for the sake of our nation," said the first President Bush in 1990 in appealing for congressional cooperation on the budget. "We must now put aside bitterness and rancor, move beyond partisanship," urged President Clinton in 1993 in trying to get Congress to pass his economic plan. What these presidential appeals for bipartisanship always mean is: do it my way. Mr. Obama said he "won't hesitate to embrace a good idea from my friends in the minority party." But he wants his way. He wants his energy policy enacted along with his jobs bill, his financial regulatory reform and his health care plan. And if the opposition continues to block his objectives, he said he "won't hesitate to condemn what I consider to be obstinacy that's rooted not in substantive disagreement but in political expedience." 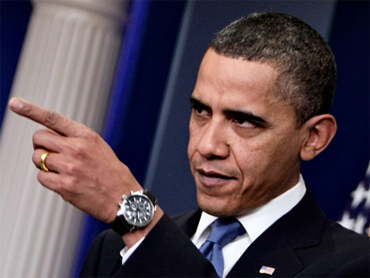 When a sitting president calls for bipartisanship by the opposition – he really means surrender. And if they block his proposals, its "obstinacy" and not political views they hold as strongly as he holds his. 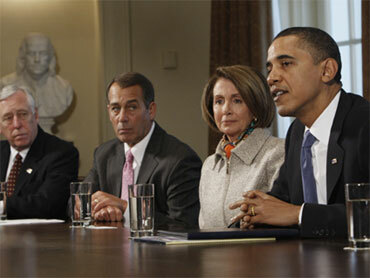 Mr. Obama again said the American people are frustrated by the political stalemate in Congress. And he can be counted among the frustrated as well. It still leaves them with a chilly relationship.